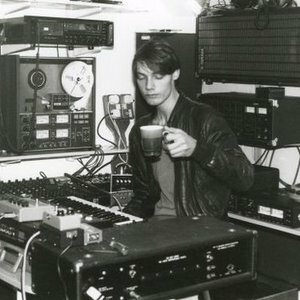 William Orbit (born on 15 December 1956, as William Mark Wainwright) is a British musician and record producer, best known to the public for producing Madonna's album Ray of Light, which received four Grammy Awards. He has also co-produced several unreleased Madonna songs originally recorded for other albums that were never used. Also, he produced "13" by Blur, and remixed some of the songs on the album. His speciality is atmospheric keyboard electronica although much of his work features accomplished guitar playing. He has also recorded several largely instrumental solo albums under the name Strange Cargo which features vocals by Beth Orton, Laurie Mayer, Joe Frank among others. He was the musical force behind Bassomatic in the early 1990s, and formed the band Torch Song together with Mayer and Rico Conning in the 1980s. He has also produced and remixed numerous other artists, like Kraftwerk, Nitzer Ebb, The Cure, U2 and P!nk. Orbit's remixes carry his signature electronic sounds and techniques, making them sought after by fans of his solo work. He also worked with pop girl trio Sugababes. His newest work has involved writing an orchestral piece, which was performed by the BBC Philharmonic at the Manchester International Festival in July 2007. He also has a new album due out in 2009 - This has now been released (8th June 2009) "My Oracle Lives Uptown"